Momentum is crucial to any successful community: Activity breeds activity. Spring is in the air, with brand-new communities and new phases of existing ones popping up after a long winter. Builders nationwide have been saying that sales results in 2018 will be a huge success or a massive failure, depending on how early they can gain sales momentum in their new projects. Momentum is crucial to any successful community: Activity breeds activity. When prospects see streets buzzing with contractors and rooflines popping up, it makes them feel more certain about buying a home from you. But the challenge with a brand-new community is that you won’t have this advantage. Most builders will ask a salesperson to sit in a trailer at the front of an empty field and expect a few signs to draw people in. The message? “Pioneers and Risk Takers Wanted for Unproven and Currently Invisible New Home Community.” It’s the opposite of momentum and no prediction of success. Why are new community launches so stressful? Why do they often fizzle out instead of take off? 1/ Lack of Organization. No one seems to have all the necessary information until moments before—or after—it’s needed. Too often I hear about teams being given information on what to sell 48 hours before they’re asked to start selling it. 2/ Lack of Interest. Builders don’t know how to build a large enough interest list for the project. Unless you’re building in an A+ location, you can’t rely on pent-up demand to drive interest. 3/ Lack of Process. 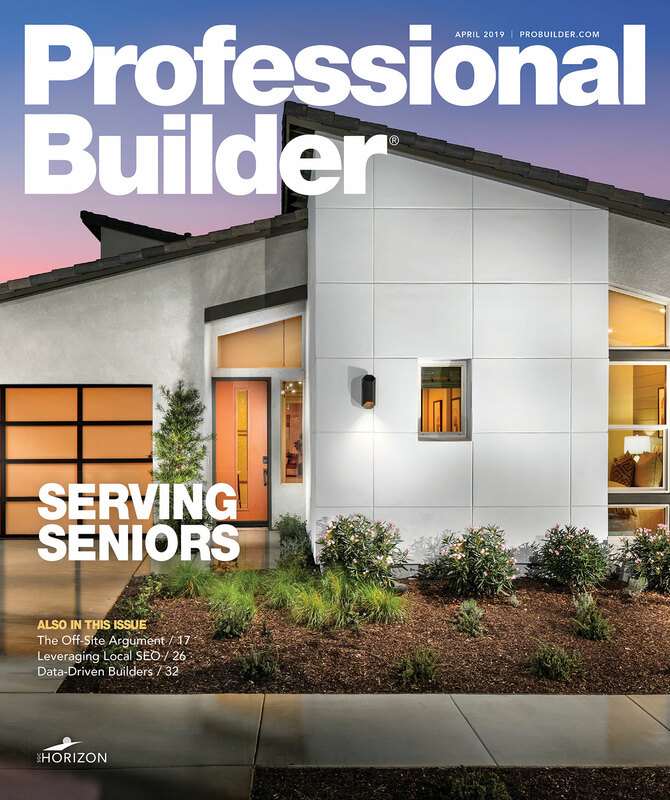 Builders have such a big interest list that they don’t know how to communicate to buyers or nurture the list to make sure buyers are ready and willing when the grand opening occurs. Sometimes a big interest list causes a builder to be overly confident about the success of the project. This, in turn, can cause a lack of urgency internally. These struggles can vary from one community to another, but you’ve probably experienced them at some point. It doesn’t have to be this way. Every past misstep can be avoided in the future if you have a process to build on. Start by documenting. Writing the process down will allow you to apply and adapt it based on your experiences. 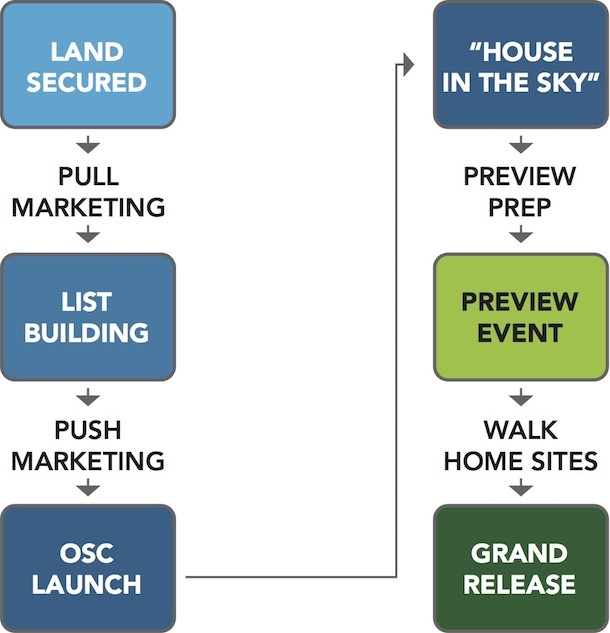 The Presale Without Fail process shown in the diagram below has helped many builders and developers around the country since I first published it seven years ago. It was recently used to drive $45 million in sales volume during the opening weekend of a brand-new community in Virginia in late 2017. Land secured: As soon as you have a signed land contract, install signage with basic information: product type, municipality, and school district. Don’t yet communicate pricing or timing. Signage should drive people to your website so they join a VIP list to stay informed ahead of the general public. Pull marketing: Once signage and basic website information are up, you’re drawing in prospects. Very little advertising money, if any, is needed at this point. Keep information broad—no site maps or floor plans yet. This protects you from delays that will occur and will also keep prospects on the hook to pay attention to your follow-up as you slowly release this information at strategic times. List building: Your goal is to get three times the number of qualified VIP list members as home sites being initially released. Add surveys to determine if you’ve reached your goal, provided you position them as market research and not a sales tactic. You’ll be surprised how honest people will be. Push marketing: As you approach 60 to 90 days from launch, your list still may not be big enough. Promote the community using digital advertising. Don’t go cheap here: You’re spending money to get early momentum that will make future sales easier. AdWords, Facebook, Instagram, email marketing, and Zillow are my preferred channels. Online sales counselor (OSC) launch: For most builders or developers, the online sales counselor or inside sales rep is the point person who can cultivate the VIP list. This person is already set up to communicate with hundreds of people each week via email, phone, or text message. During the OSC launch, the counselor will broadcast to VIPs on your list that base pricing is now on the website, and that one-on-one sales appointments are now available. “House In the Sky” appointments: These appointments with the on-site sales team allow the sales prospect to get an expert’s help choosing a floor plan and understanding pricing. They’re “House in the Sky” appointments because you still aren’t releasing specific home site details. The goal is to make sure the prospects understand options and pricing so they can determine if the community is a good fit. This ensures a big turnout at your preview—people will want to see details. The meetings also break information down into two parts: the house they love and the best site to build it on. The information is thus easier to take in and less overwhelming. Preview: This special event offers a complete picture of every aspect of the community. Site details and premiums are unveiled. The sales team can work one-on-one with prospects to help them marry their perfect home with the perfect site. What’s key here is that the event creates urgency because your prospects see all the other potential homebuyers in the same space. Your sales team is now in the driver’s seat. Walk home sites: Prospects walk the site they selected at the preview and finalize paperwork for the contract. Everything except for the signature and hand money are prepped to make the grand release go as smoothly as possible. Grand release: Allow your prospects to turn in their signed contracts with hand money on a first-come, first-served basis on the day of your grand release. All of your team’s hard work pays off, and you can begin using the early momentum you created to get others off the fence and into the sales office. Over time, new community openings will be as routine as new model home openings. For more information, download the free 30-page e-book at PresaleWithoutFail.com.